EMT set screw connectors are used to join EMT pipe to a junction box. Connectors include three drive screws Robertson /Star/ slot. One screw from ½”, ¾”, 1”. Two screws 1¼”- 4”. 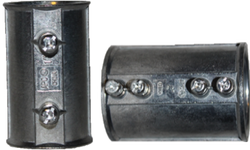 EMT set screw couplings are used to join two EMT pipes or an EMT pipe to an EMT elbow. Joints include three drive screws Robertson /Star/ slot. Two screws from ½” - 1”. Four screws 1¼”- 4”. EMT Compression Connectors are used to link the EMT pipe to a junction box. EMT compression couplings are used to join two EMT pipes or an EMT pipe to an EMT elbow. Romex connector used to secure connection of flexible cables or NM-B cable box. Connectors include three drive screws Robertson / Star / slot. 3/8” - ½”, ¾” & 1”.